We design and implement effective talent strategies to help you attract, develop, and engage top-talent to grow your company. Great companies have great TalentDNA™! Companies wining today’s war for talent understand that spinning the talent flywheel as fast as possible is the engine to business performance and growth. TalentDNA™ is what is at the root of companies who succeed through people. By aligning Talent Attraction, Talent Development and Talent Engagement strategies with the overall business strategy; TalentDNA™ grows and strengthens, ensuring you having the right people with the right skills, abilities and attitudes, at the right time to grow your business. Effective talent strategy doesn’t need to be complicated or expensive. There is a formula card making your people the engine of your business. This is where ML Talent Strategies comes in. We develop implement and manage a turnkey talent strategy, aligned with your business growth plans that will produce results and ensure you have the right people, with the right talent, at the right time to grow your business. We engage with your company for 90-days to analyze your companies TalentDNA™, Talent Attraction, Development and Engagement systems and develop a 3-year comprehensive talent strategy that will ensure you have the right people, with the right talent, at the right time to grow your business. Once your custom talent strategy is developed, it is execution time. Select the TalentDRIVE™ implementation option that is right for your business. With each TalentDRIVE™ option, we engage as your guide to implement and manage your custom talent strategy, ensuring you have a non-stop stockpile of talent that will DRIVE your growth. TalentGC™ – ML Talent Strategies will serve as your Talent General Contractor, responsible and accountable for implementing and managing your custom talent strategy including attracting, developing, engaging and retaining talent to achieve your strategic plan. We tap into our 100+ years of combined experience from our Talent Strategists and hand-selected pool of talent partners to ensure the strategy is executed and managed with precision. 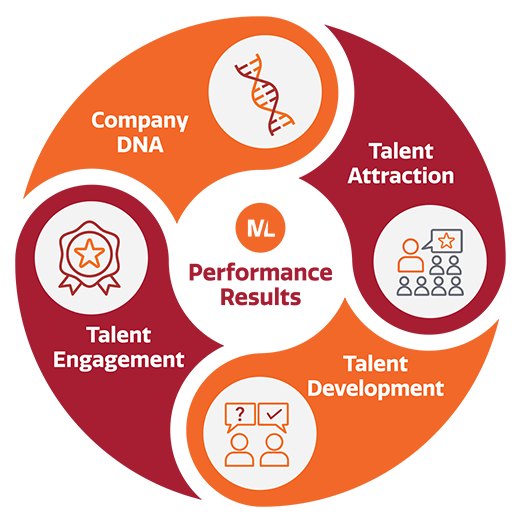 TalentCOACH™ – If you prefer to build an in-house talent department, ML Talent Strategies will coach your internal talent leader in implementing your custom talent strategy. If the TalentCOACH™ option is right for you, but don’t have someone on your team to designate as the leader of your talent department, we will find someone for you, and coach them. TalentHR – We believe HR has a significant impact on an organization. HR protocols and practices must align with the organization’s culture. Throughout the TalentDNA™ process, we often find that companies are at significant risk with their lack of HR protocols and discipline and it is eroding their culture. When this is evident, we partner with the leadership and/or the human resources team to bring that alignment in key areas such as HR assessments, policies, best practices, handbooks, on-boarding, competencies, compensation, benefits and much more. This partnership can be through an ongoing relationship, project based work, or one-off needs. With all the right talent strategies in place and the Talent Flywheel spinning at full speed, you can grow your business as fast as you like with the confidence you have the talent to execute on your plans.